Play Africa Goes Wild Slot Online with 500 Free Spins! Join the tribe and sharpen your claws in Africa Goes Wild slot game, as exploring the continent will let you discover many chances to win real money that is worth roaring about. You have stumbled into an African village in Africa Goes Wild slot game as behind the reels appear a flat terrain with a lone thatched hut, trees, and mountains in the distance that occasionally send up a puff of strange black smoke. Perhaps this is no mountain, but an active volcano and this is confirmed in the nighttime Bonus when lava can be seen spitting out. As you spin the reels, creatively bordered by a totem pole of tribal masks of different expressions, exotic animals graze in the background. High to medium value symbols include the African Wildlife on your safari tour: a lion, an elephant, a rhino, an ox, and a leopard. There is also a Wild, a x2 Wild (for the Bonus), and a Free Spins Bonus symbol. Of lower value are standard playing cards A, K, Q, J, 10, and 9. Visually, Africa Goes Wild online has a very impressive and well-designed graphic in a realistic style. The ‘wow’ factor is really with the creative animations, such as each animal coming alive on the reels during spins or when they stampede on the reels. The background vista also immerses you into a moving environment. There is also much thought put into the background music, that captures the tension and excitement of Africa in the main game and then becomes livelier for the Bonus round. The sound effects of the animals, or the tribal chanting to celebrate winning combinations also enhance the quality of the theme and overall fun of gameplay. 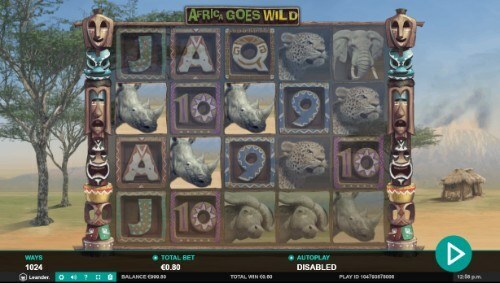 Grab the Rose Slots jeep and head to the water hole in Africa Goes Wild online, where you can explore the many thrilling ways for generous payouts by becoming one with nature. Sending you on this exciting and exotic safari in Africa Goes Wild slot is one of the best online casino games designers, Leander Games. With headquarters in both the UK and Argentina, Leander Games has continually built innovative slots that showcase detailed and immersive visuals, engaging gameplay, and bonus features with exciting chances for generous payouts. A quick glimpse at the Leander Games site shows their passion for putting together the best team of developers when creating engaging slots, and that they are not afraid to collaborate with others. This is reflected in their many partners and/or affiliates such as blueprint gaming and sunfox. Players of online casino UK can discover a whole range of other Leander Games titles such as ‘Dragon Slot’, ‘Golden Wild’, ‘3 Blind Mice slot game’, ‘Wild Jane’, and ‘Queen of Thrones slot game’. Dangerous predators, boiling sun, pesky insects, and erupting volcanoes do not exactly spell vacation getaway, but you can enjoy the beauty of the Savanah minus all the hassle in Africa Goes Wild slot as gameplay is fun, engaging, and easy to understand. With 5 reels, 4 wager rows, and an amazing 1,024 ways to win, you may be crowned the new chief of the tribe and become an animal whisperer. The Wild on reels 2, 3, and 4, replace all other symbols (except the Bonus) to award wins. On any random spin, an ‘Animals Go Wild’ feature can occur whereby one of the animals will randomly turn golden Wild and all its other symbol will convert to Wild for a greater winning opportunity. If only 2 Free Spins symbols land on the reels, you will trigger the ‘Animal Stampede’ feature that could nudge an extra third Bonus symbol to launch the Free Spins round. The lion as the king of the jungle naturally represents the highest paying symbol with 5 on the reels awarding an exciting 300 coins on your initial bet. This is followed by 5 of the elephants or 5 of the rhinos awarding 150 coins. Betting has a relatively modest range in Africa Goes Wild slot from 40p to £20. If you need some time to relocate your hut because the beautiful mountain you thought behind you was actually a deadly volcano, conveniently set the AutoPlay for 5 to 100 uninterrupted spins and good luck with the move. There is also a ‘Fast Play’ slider for a quicker gameplay that can keep up with the sprinting leopards. You can also achieve a faster gameplay with the Quick Stop by pressing the spin button again to instantly stop the moving reels. While in the shade of a baobab tree, you can even enjoy Africa Goes Wild online as it is completely formatted and nicely designed as a mobile slot as well as on other devices such as computer and desktop. With an exciting Wild feature and a generous bonus round, the theoretical RTP or return to play is estimated at 96.04%. This classifies the slot as a medium to high variance, whereby you will likely enjoy larger (if less frequent) rewards on any given spin. 3 Free Spins symbols on reels 1, 3, and 5 will launch the ‘Golden Lion’ Free Spins Bonus. You then enjoy 10 Free Spins with all the Wild symbols becoming x2 Wild on reels 2, 3, and 4, for doubling your wins. You will want to keep your hawk eyes peeled for the special golden lion symbol on reel 5. Whenever the golden lion appears, it will be sent to a meter just above the reels to fill different slots for awards. These include extra spins, multipliers on your collected winnings, and the ‘animals go wild’ feature for remaining spins as well as 2 additional Free Spins. With the chance to be awarded a number of extra Free Spins with high multiplier that include the x2 Wild on the reels, and also the animals go wild stampeded creating more Wild wins, the payout potential is very exciting and something definitely worth ‘preying’ upon. This is especially the case given the Animal Stampede feature in the main game can trample out that extra third Scatter symbol to launch the Bonus Free Spins round.